Everyone loves a beach party when the weather turns warm. You don’t have to live next to the ocean to throw one of these fun parties. Surprise your kids by turning your backyard into a beach paradise — even if you’re completely landlocked. Transform your backyard into a beachy retreat by scattering lawn chairs and umbrellas around the grassy area. Lay out beach towels for anyone who gets the urge to catch a few rays. Set up palm trees (purchase these from party supply stores or make your own with cardboard and paint) and throw a few beach balls on the lawn. Bring the beach to you. Set up two kiddie pools, filling one with water and one with sand. Let your guests use the water-filled pool as a place to cool off and soak their feet. Make sure to add supplies for sand castle building to the sand-filled pool. Beach gear is a necessity at the beach, so it should be at your party as well! Require all your guests to wear bathing suits or other beach gear — shoes are optional! Make sure everyone wears sunscreen and sunglasses — wide-brimmed hats are a fun addition too! 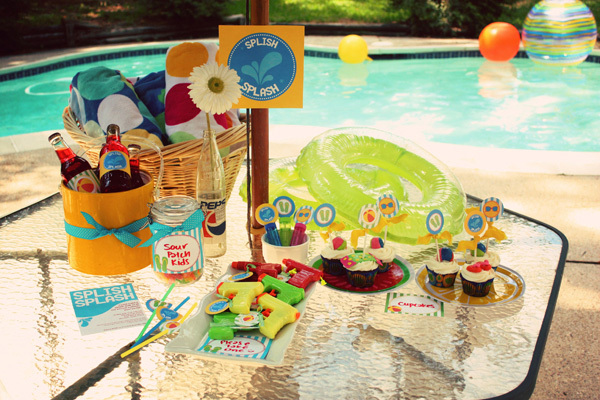 It’s not a party without food, so serve your guests a smorgasbord of beach-themed goodies. You’ve got two options when it comes to a beachy menu: picnic style or barbeque. If you go with the picnic style, serve peanut butter and jelly sandwiches, fresh fruit, veggies and simple side salads (thin pasta salad and potato salad). For dessert, serve up pies. If you choose a barbeque theme, grill hotdogs and hamburgers served with side salads. For dessert, serve snow cones, smoothies or ice cream cones. Set up a buffet of snacks, filling plastic beach buckets with chips, fish crackers, pretzels and cookies. If the weather is warm, make sure to provide lots of drinks to keep your guests hydrated. Fill a baby pool with ice and add bottled water, juice and sports drinks. You can’t have a party without a little entertainment. The pool and sandbox will provide your guests with a good time, but include some other activities as well. Set out a few hula hoops and a lawn sprinkler. Have a water balloon fight (hey, you have to get wet at the beach!) and set up a volleyball net if you have the room. Provide a private changing area for guests who don’t show up in their bathing suits.